Taxing the air we breathe may be coming to Washington state. Yes, the insane taxing of every behavior is rising to a whole new level with the proposed "bike tax" in Washington. According to lawmakers who proposed the bike tax, it would help raise $1 million over the next decade to be used for road maintenance. The new $25 tax will be applied on every bike sold for over $500 in the state. One Washington lawmaker is making twisted argument in support of the new fee. 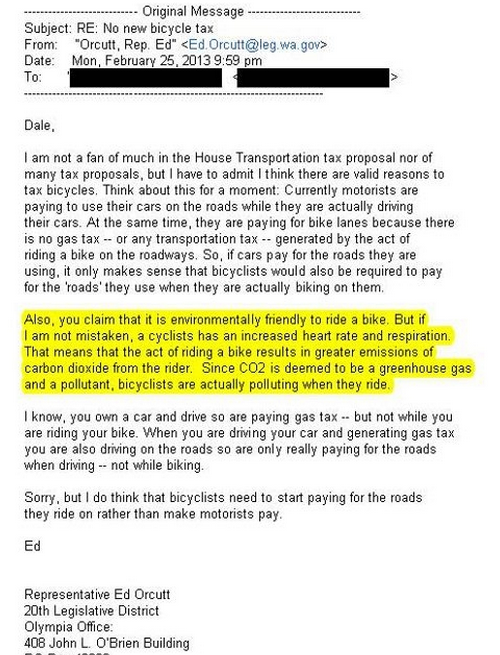 Rep. Ed Orcutt wrote in an email to a bike shop that the CO2 that bicyclists exhale while riding is just one of the reasons he supports the bike tax. "Since CO2 is deemed a greenhouse gas and a pollutant, bicyclists are actually polluting when they ride," Orcutt wrote. Therefore, they should pay taxes to help the environment as well as the roads.